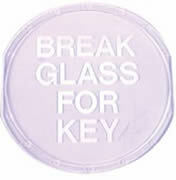 Single pane replacement generic glass for the small round break glass cover which has "BREAK GLASS FOR KEY" painted on it. (STI-6700). Great Product and great price, we use it for a emergency key and have had to break the glass one time it did not shatter so clean up was simple and it's easy to replace.